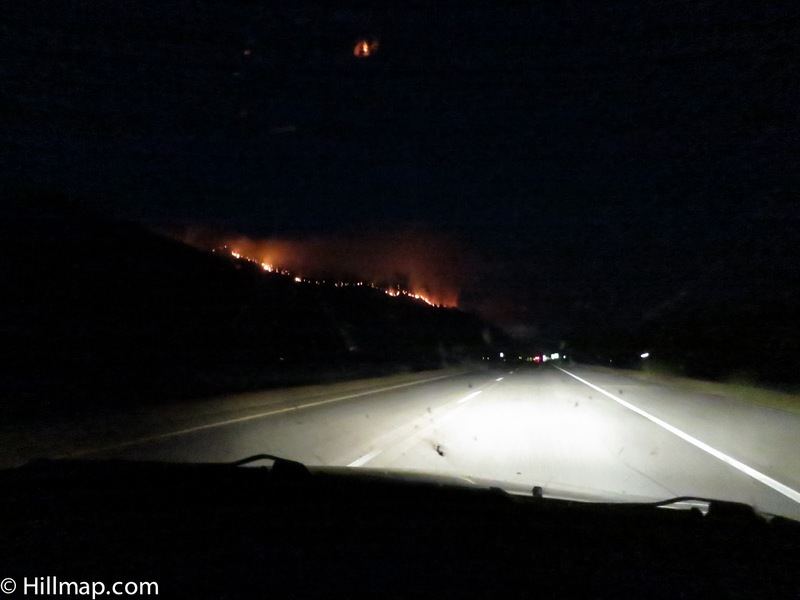 The West Mullan Fire from I-90 west of Missoula. Wildfire season is in full swing across the American West. 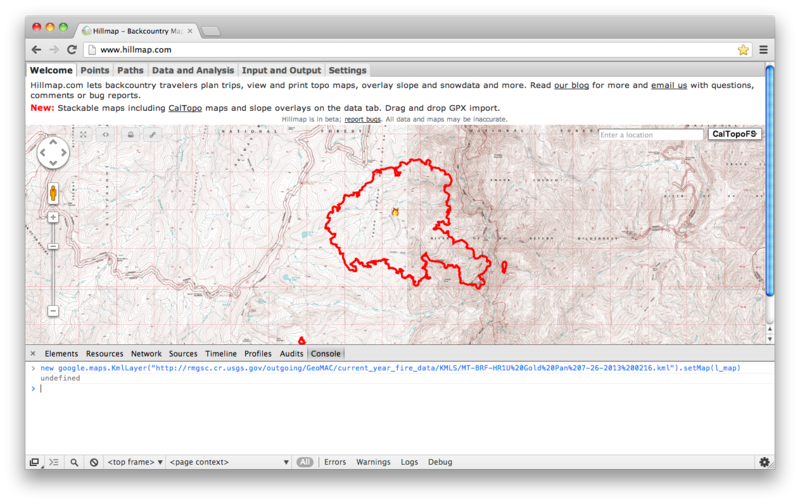 You can view updates on various fires on inciniweb, but the maps showing perimeters are a bit small and don't have any map layers beyond the basic google terrain and satellite maps. Find the fire you want to map on inciweb. 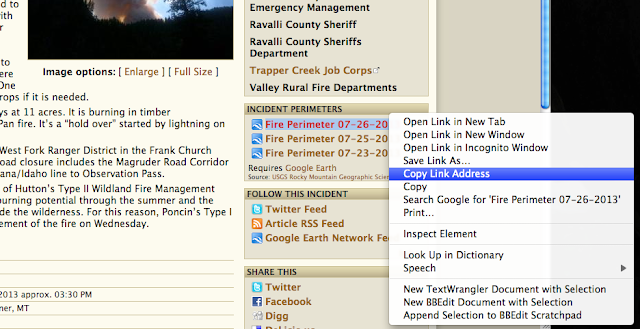 There is a list of all wildfires on the home page, or you can search by state or incident. On the inciniweb incident information page for that fire, there is a list of Incident Permiters on the right. 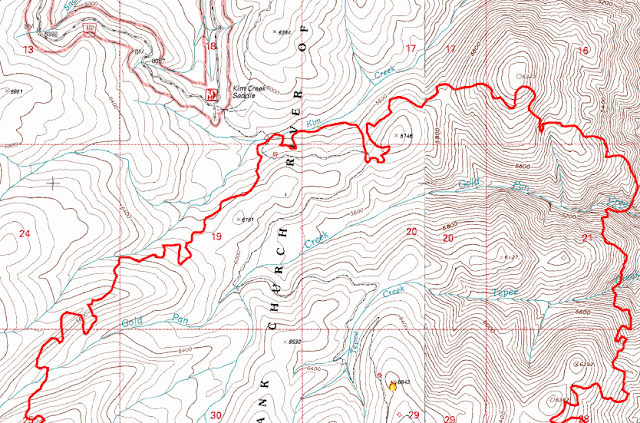 They suggest viewing these in Google Earth but we'll copy the Address (or url) to load into hillmap instead. 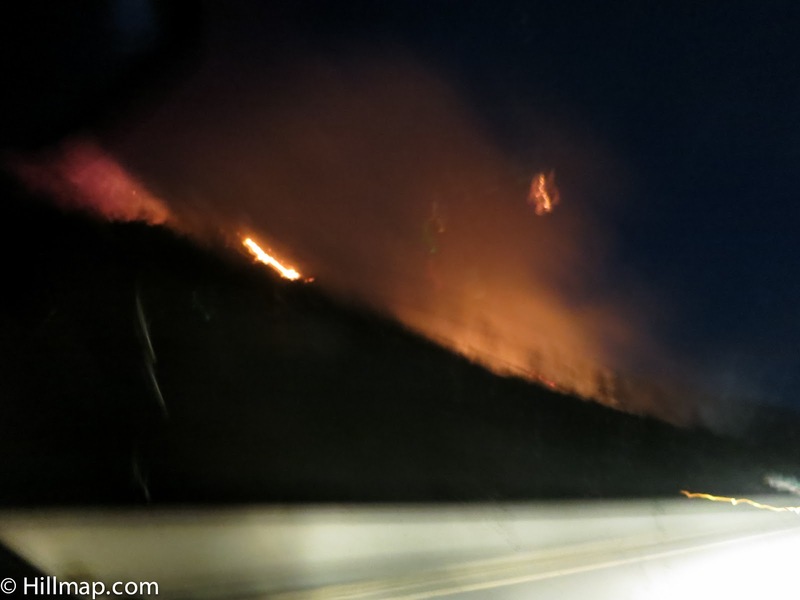 Newer fires may not yet have an incident perimeter online until they have been mapped with a fly over. Right click on the permitter you want and click "Copy Link Address". The only tricky thing is that the url needs to be contained in single (' ') or double (" ") quotes. Note: to make a printable map you can do steps 2 and 3 on the print page window before you print. For any developers out there the left and right map objects in hillmap are global objects called (creatively) l_map and r_map. Feel encouraged to play with them and let me know if you come up with something cool! 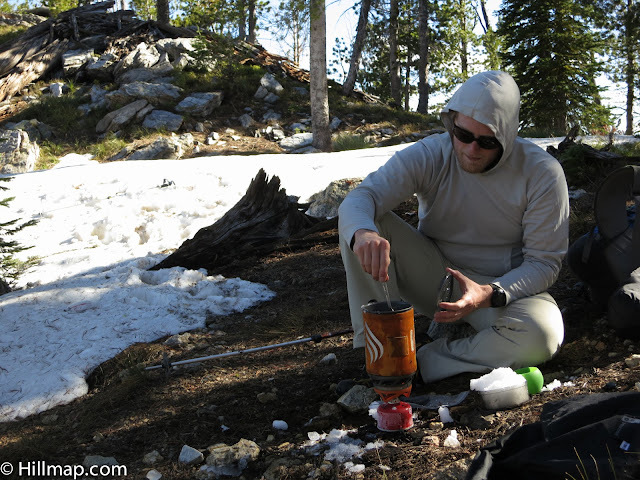 The old Jetboil shown here is a snow melting machine...except when it is cold. I love the convenience and efficiency of Jetboil stoves but their upright canister design falls short in temperatures below the boiling point of butane fuel. Gearcaster has a write up of Jetboil's new Joule Group Cooking System which uses an inverted canister/liquid fuel feed to increase cold weather performance. The pot is 2.5 liters and I wish it was a bit smaller/lighter as I think the perfect use for a winter Jetboil would be melting snow on long day ski tours. Would an inverted canister head that worked with my existing ~1 liter Flash and Sumo pots be too much to ask? Foam helmets are far superior to hardshells for most climbing since they offer better protection against off center impacts as seen in falls. 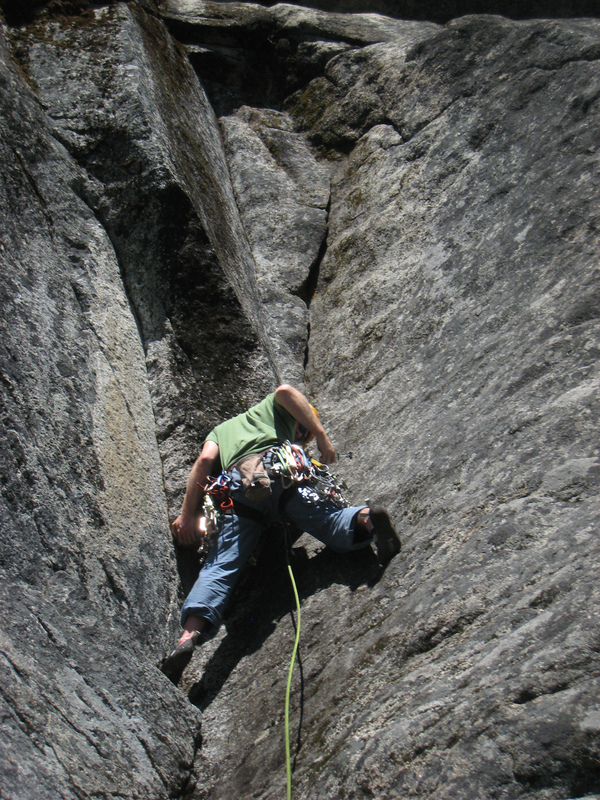 The Petzl Meteor is one of the top choices but has traditionally come in one too-small-for-ryan too-big-for-jen size. Next year it comes in two sizes according to Outdoors Magic. Black Diamond also does two sizes in their Vector and Vapor as well, lets hope everyone follows suit. I'd love to see foam climbing helmets in full ranges of sizes like bike and ski helmets. Jen wears her Houdini for protection from wet spring snow. 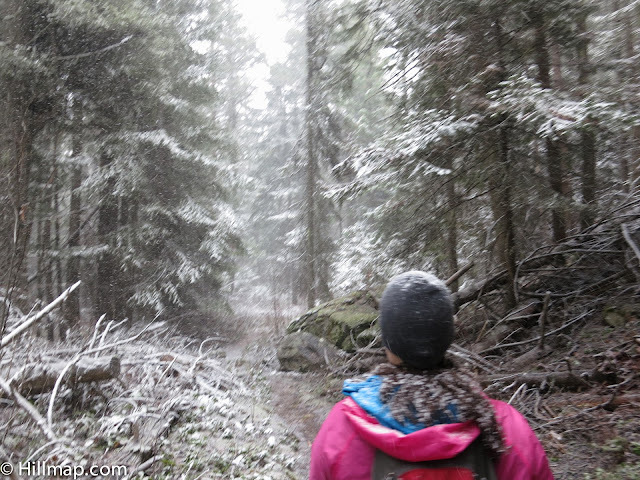 My old Patagonia Houdini is one of my two favorite jackets and I was surprised to see Patagonia turning it into more of a trail running piece with a tight fit less suitable for alpine layering duty. Outdoors Maging has it that they are coming out with a new Alpine Houdini which is fully waterproof. I'll wait to see how breathable it is and how the cut works in practice but if it lives up to the versatility of the old one I could see it being a great piece. This Jacket is now a line of packs. 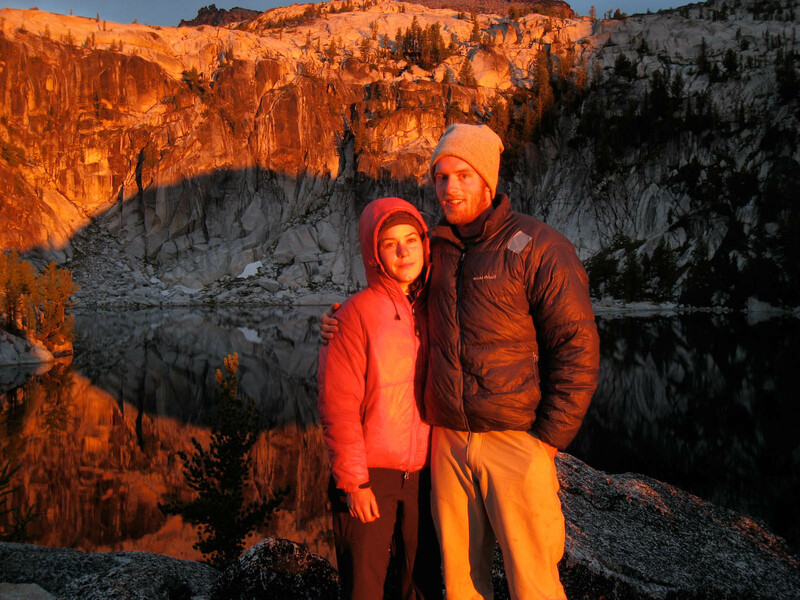 The durable, versatile, breathable Ascentionist softshell is my other favorite jacket. 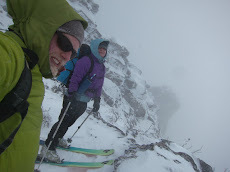 Perfect for everything from cold weather sport climbing to ski touring. I was excited to see Patagonia is bringing back the Ascentionist...as a line of packs? Gear Caster has the story on this one. The packs actually look quite nice (streamlined alpine packs with A frame ski carry) but I'm still wondering what to do when my jacket finally dies. 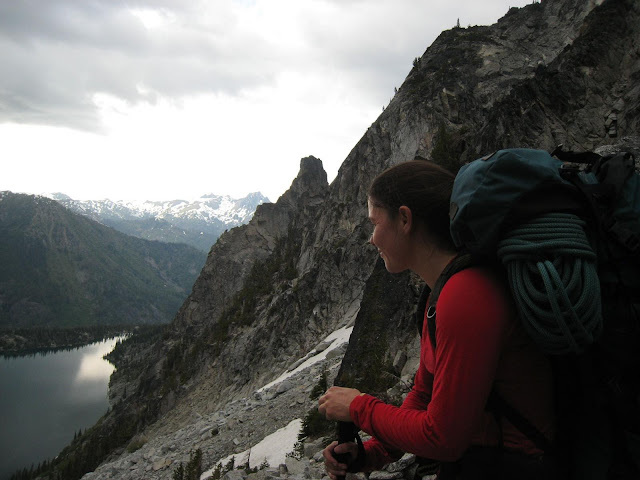 Jen hasn't found a pack that carries as well as her 38 liter Arc'teryx Khamsin. She has taken to lining it with a garbage bag so gear doesn't fall out through the holes she has worn in it. Also note her Patagonia Houdini. 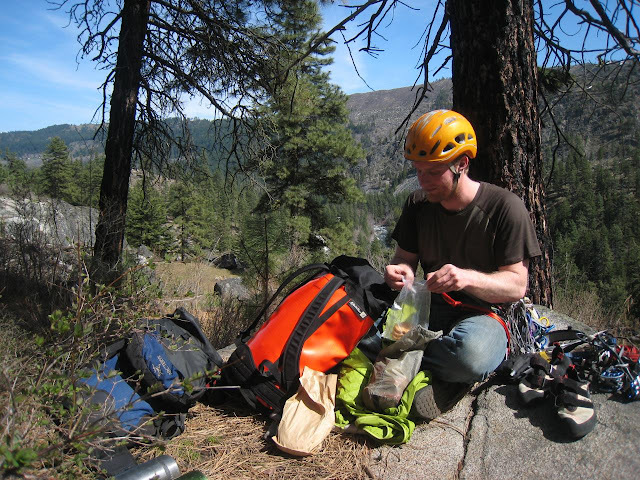 Arc'teryx makes packs that carry loads well but lots of times they seem to use exotic materials and features that drive up cost and price. Their new Alpha FL 35/40 (gearcaster) seems to be a super simple/clean alpine pack with a reasonable price compared to some of their packs. Jen's old Khamsin 38 has acquired more then a few holes and this could be worth looking at as a replacement if the little tabs on the side can be used to attach compression straps for doing A-frame ski carry on it. 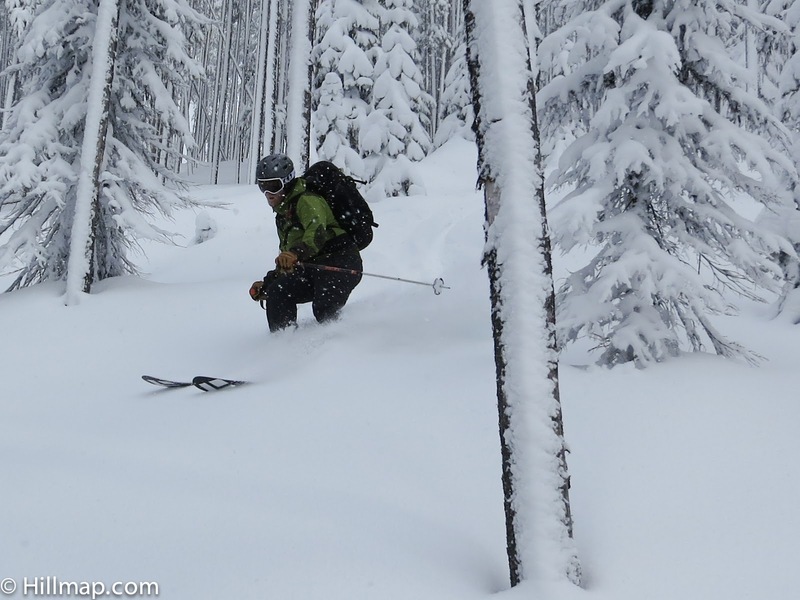 Seattle based Outdoor Research is a respected brand long known for well made gaiters, hats and gloves. 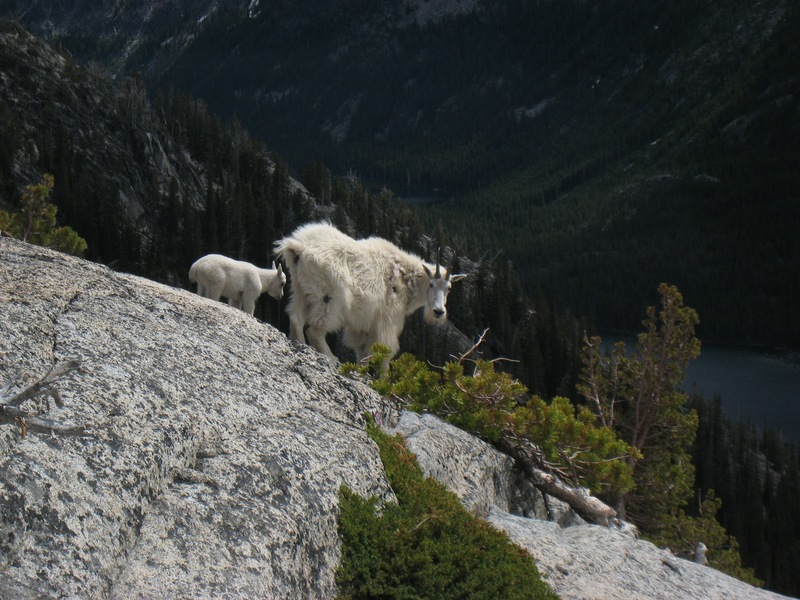 They have been reinventing themselves the last few years to have a full apparel line and appeal more to "core" climbers and skiers. I was excited to see that they are coming out with some non traditional designs like convertible ultralight wrist band/wind mitts and gloves with built in wind mitt, ultralight gaiters and "sun sleeves". 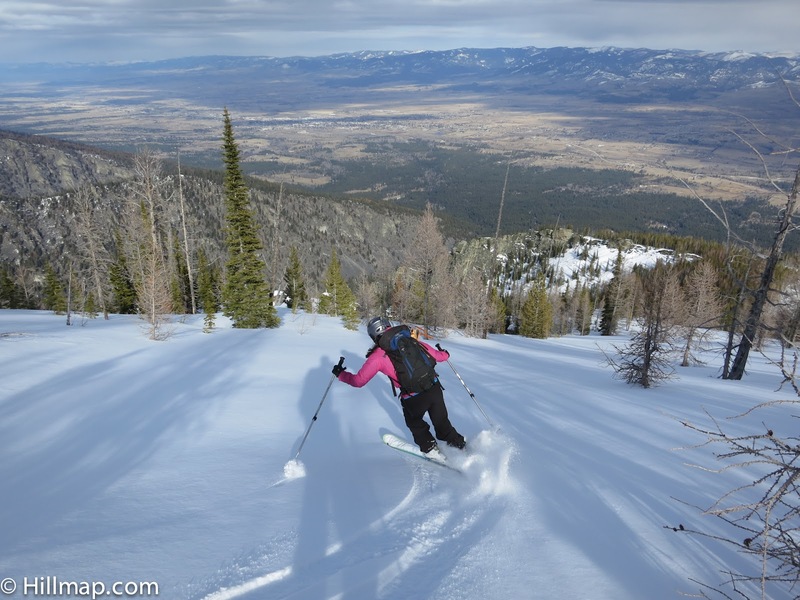 Gear like this can really work to keep you comfortable in changing conditions (like ski touring up to a stormy ridge line) but I usually expect to see more of it from European brands like CAMP. It is nice to see the Seattle Home Team stepping up! Hiking in Finland has the write up on these and gear from some other brands. 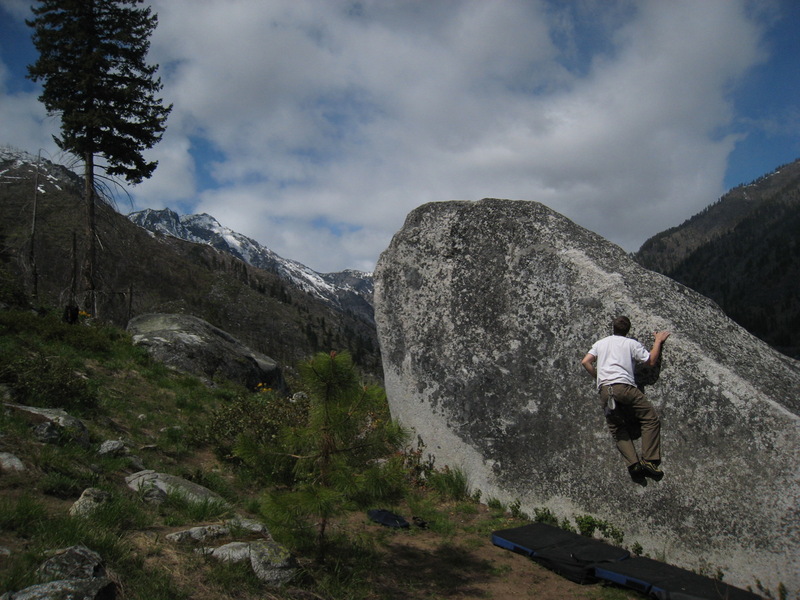 Will this be the end of footwork frustrations with the polished stone of the River Boulders at Index, Wa? 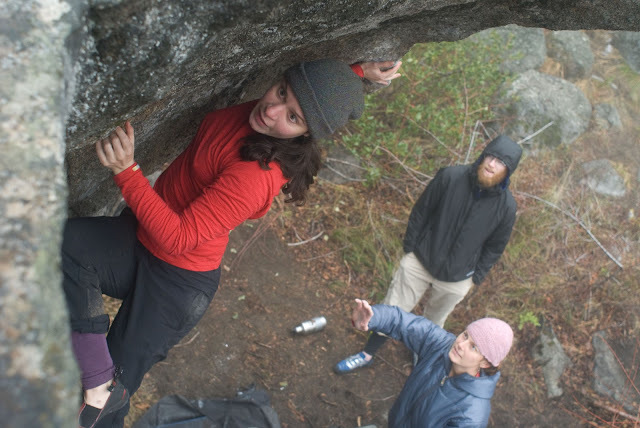 Long regarded as the premier maker of sticky climbing rubber, five ten has a new soft and sticky rubber originally developed so that Tom Cruz could climb glass (really). It will be coming out first on what looks to be a softer version of the excellent "Team" downturned slipper. Youtube video from epic tv. Gearcaster. 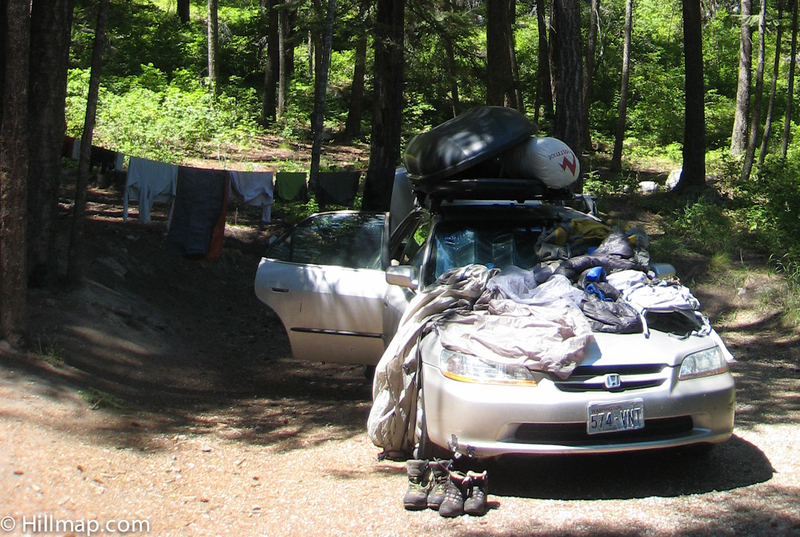 Trailspace and Gear Junkie usually have some info as well once Outdoor Retailer rolls around. I hate wet feet. 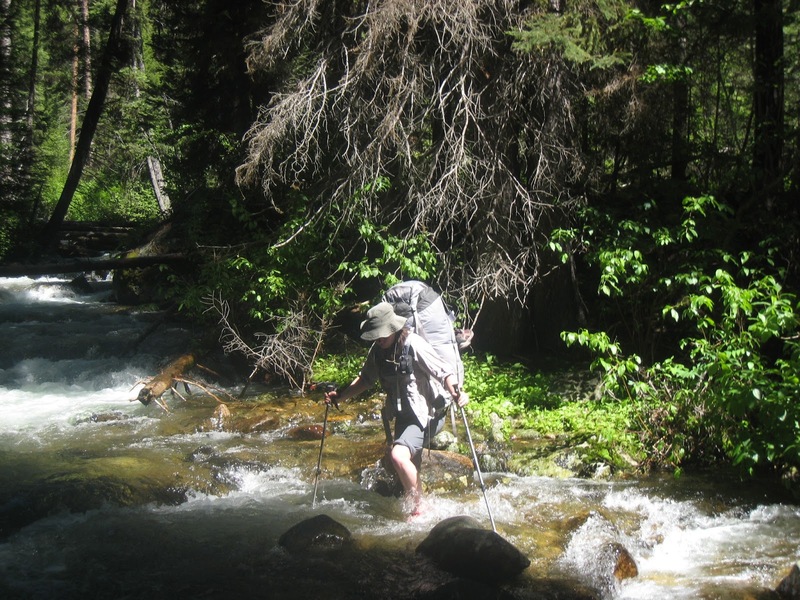 Enduring sloppy, soggy shoes while hiking can make an otherwise enjoyable hike a slog to be endured. Wearing a pair of sandals for crossing streams helps keep my feet drier and protects them from sharp rocks and sticks - not absolutely necessary but very nice. 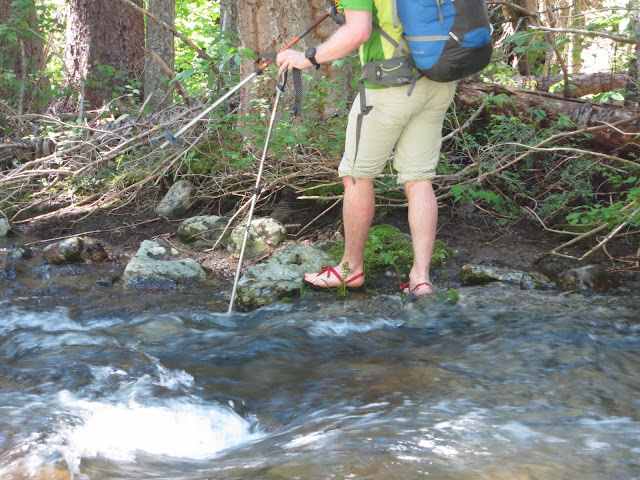 Here's how to make your own lightweight stream crossing sandals. A sheet of vibram - we used a 10mm Vibram 8870 Newflex rubber soling sheet. 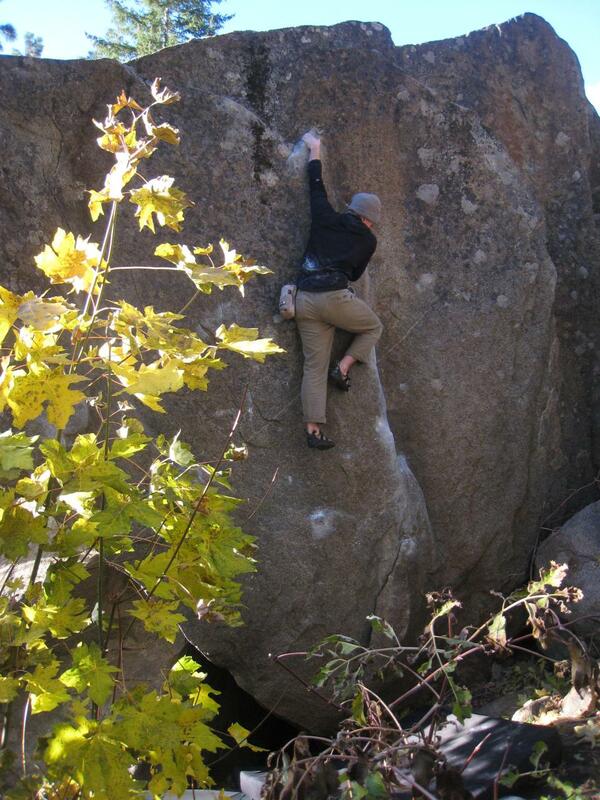 This rubber is light, durable and had pretty good traction on slippery rocks. The 10mm thickness gives my foot a little more protection than a thinner sheet would and I could conceivably hike in them. Looks like Vibram 6mm 7175 "cherry" soling would also work, it is supposed to be good and sticky. The tools I used: a cutting board, box cutter, lighter, scissors and needle nosed pliers. 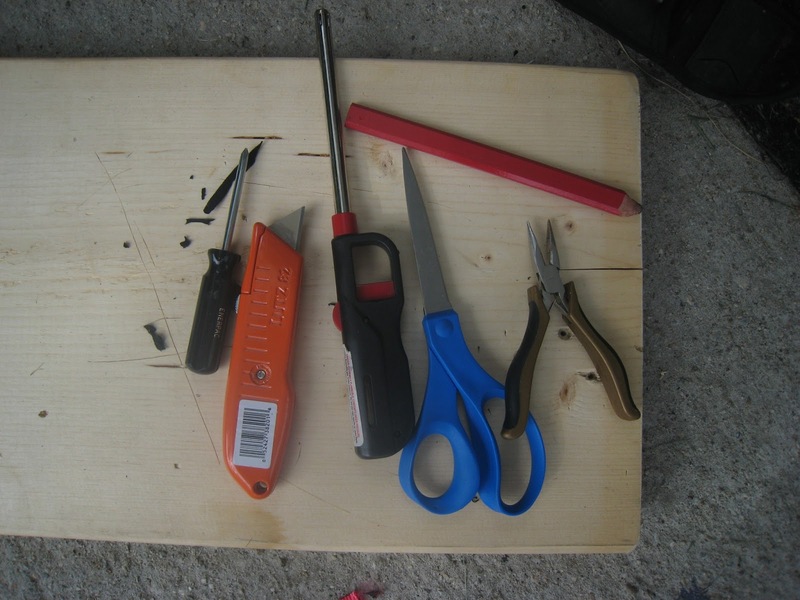 I did not use the screw driver, but it might come in handy for pushing webbing through the slits in the sole. There are two ways to do this: trace your feet directly on the vibram or make a pattern on paper first. I traced my feet directly on the vibram for simplicity. 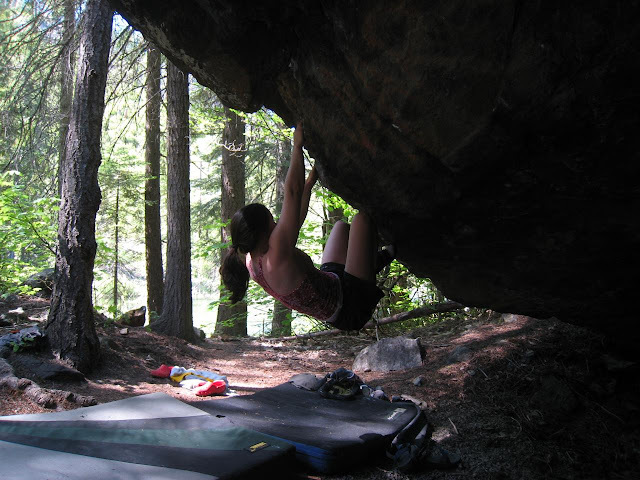 Place the square of vibram on a hard, flat surface that is well lit. 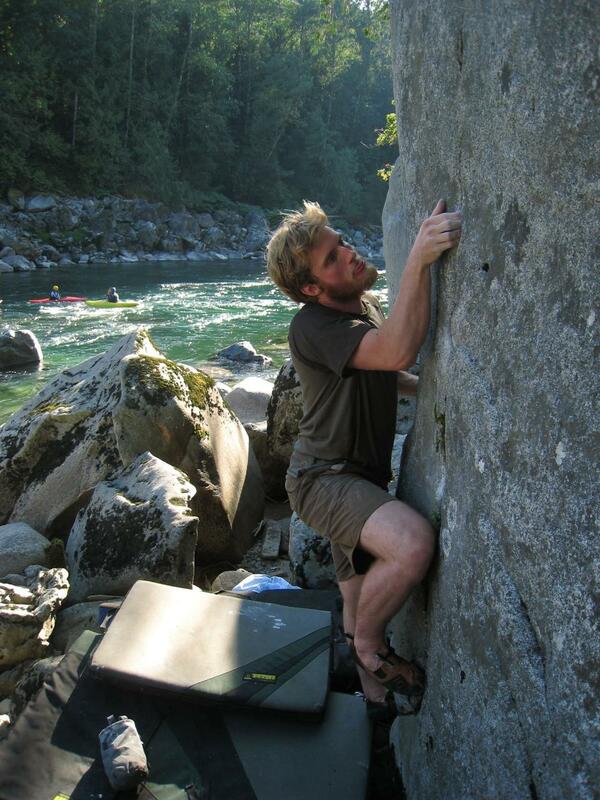 Next, place one of your feet on the vibram. Start in a corner or near an edge to maximize your vibram and get multiple pairs of sandals out of one sheet. Ryan's foot bed has nice rounded toes that follows the shape of his foot. Note the extra vibram around his instep. He is marking the spot for a webbing slit between his toes in this photo. Trace around your foot, staying quite close to the foot itself. Round the toes. Keep a little extra space around your instep (don't trace tight to your foot at the instep) and below/just in front of your ankle bone. You will be cutting slits in the vibram at your instep and just in front of your ankle bone and a little extra vibram in those areas will keep the slits stronger. 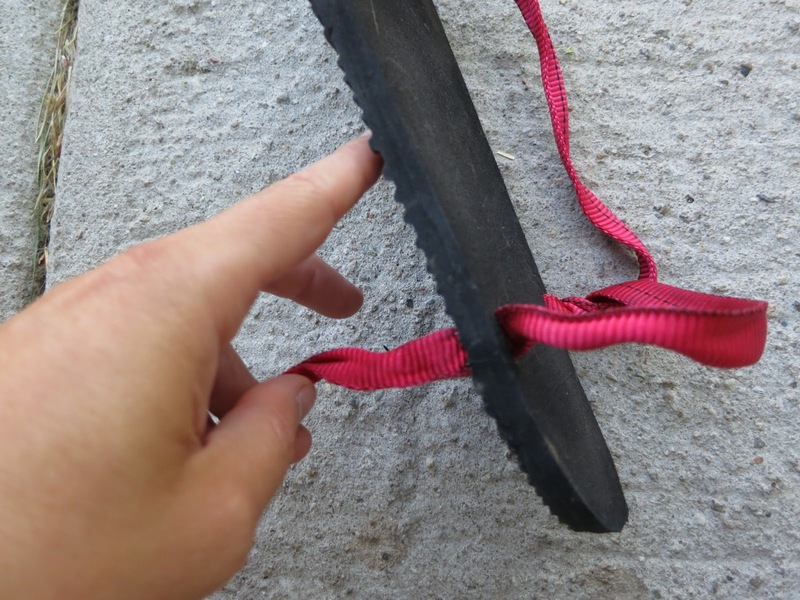 One of Ryan's sandals ripped at the instep slit because he cut the slit too close to the edge - it was easy to fix in the field with a good knife but better to avoid the problem. 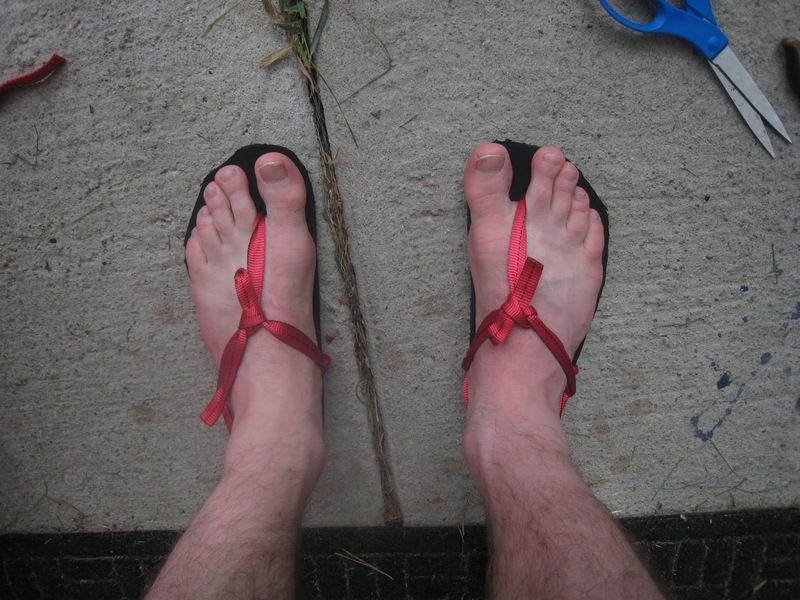 I am a person who likes a little bit of toe buffer because I tend to stub my toes on rocks, but adding too much extra at the toes for these sandals will make them unwieldy in fast water. 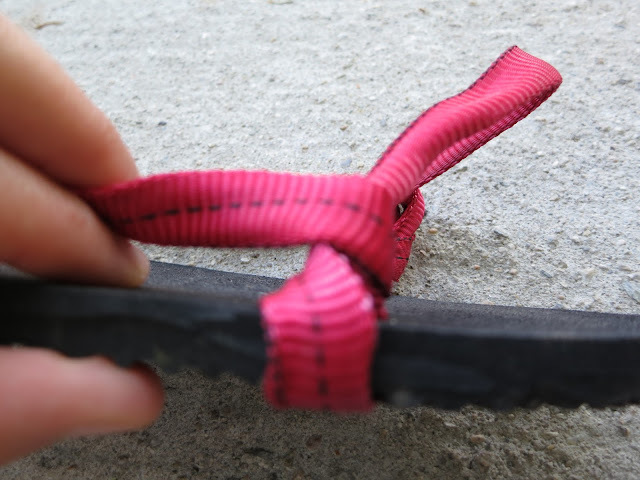 The key to a manageable toe buffer is placing the slit for webbing in the right spot, not adding a bunch of extra rubber to the front of the sandal. Now place the sheet of vibram on your cutting surface and use the box cutter to cut out the footbed you traced. I had to press quite hard and gouged my cutting board to cut through the tough vibram. The webbing straps will hold your foot quite securely if you put the holes for webbing in the right place. One goes between your toes, one at your instep and one just in front of your ankle bone. First, place your foot on the footbed. Place a mark with the pencil between your big toe and second toe (see photo above). The trick is not to place your mark too far forward. I angled the pencil back and down toward the ball of my foot to make a mark slightly under my foot. This will keep your foot from sliding too far forward when you are walking. Place the mark at your instep just in front of your heel at the narrowest part of your foot. Keep a little space between the edge of the footbed and your mark. Place a mark on the outside of your foot at the narrowest spot, about opposite of the mark you made for your instep. This will be below or just in front of your ankle bone. 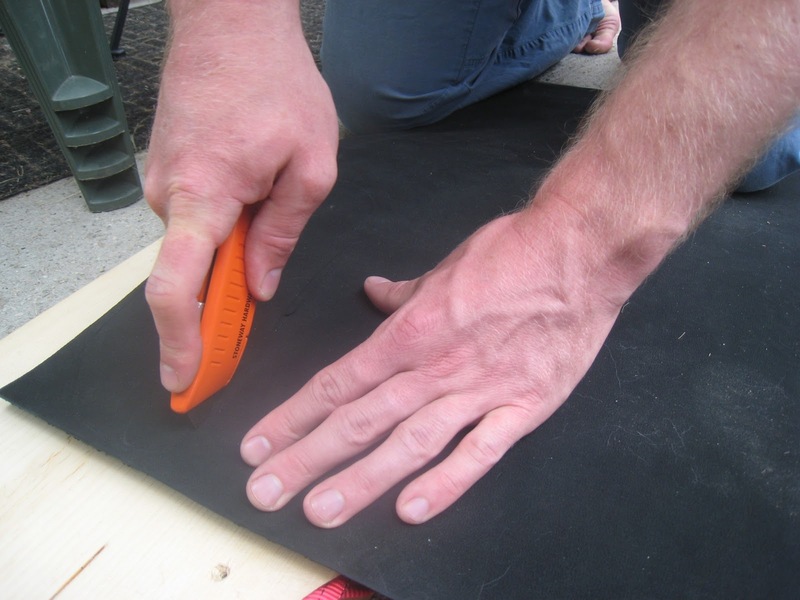 Use the box cutter to punch through the vibram and cut slits at all three marks you made on the vibram. The slits should be just a tad longer than your webbing is wide. 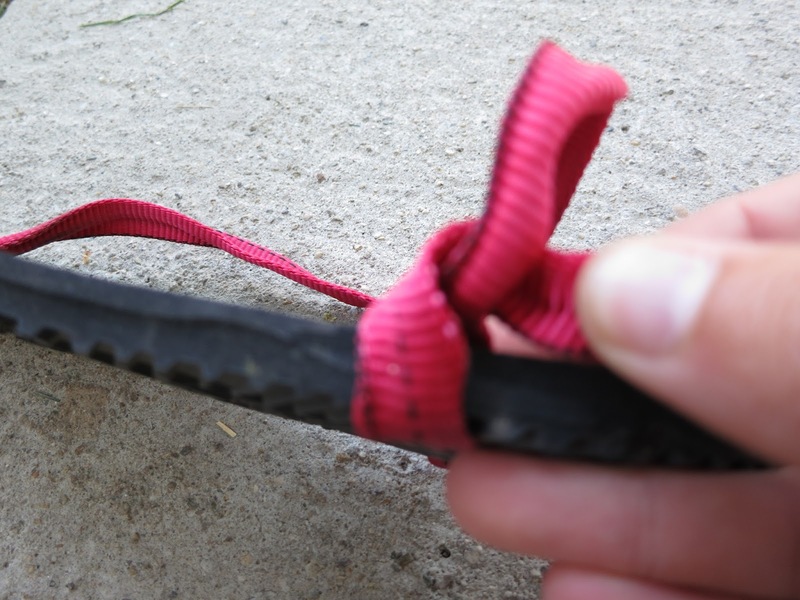 Tie an overhand knot in the end of your webbing. Make the knot as flat as possible by removing twists in the webbing. Pull tight. 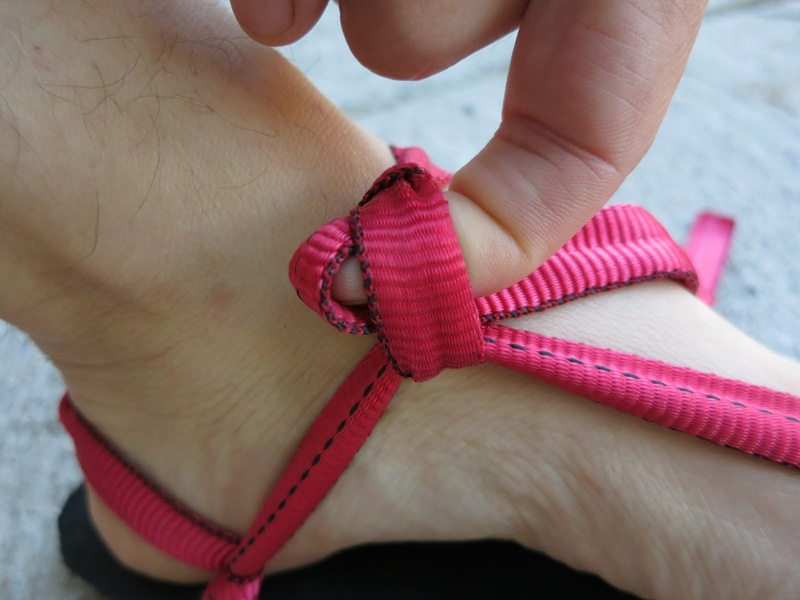 Begin by threading the webbing through the slit between your toes. 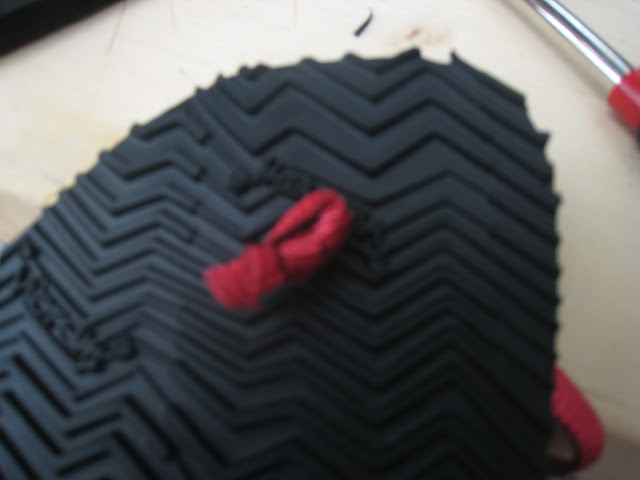 Start by pushing the needle nose pliers through from the foot side to the sole side. Grab the free end of the webbing and pull the webbing through until the knot hits the sole. Pliers punching through from the sole side to the foot side. 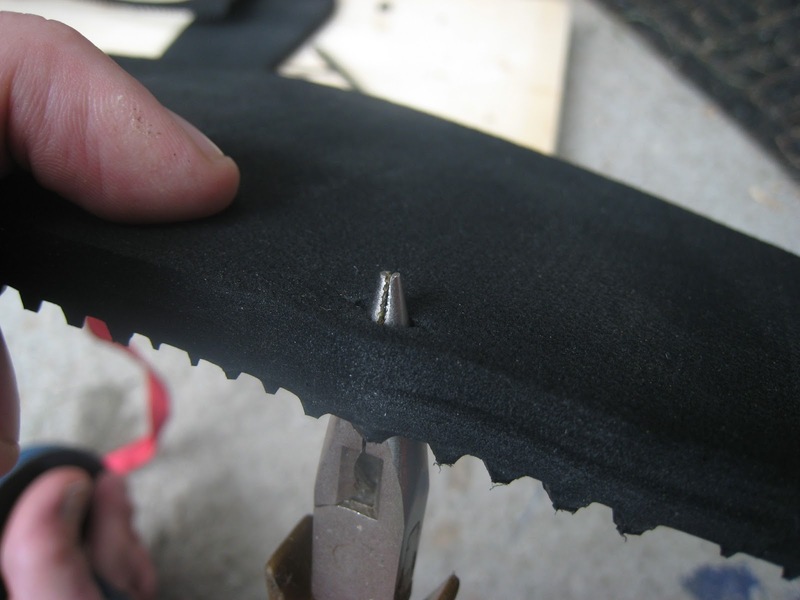 Now push the pliers through the footbed at the instep slit, from the sole side to the foot side. 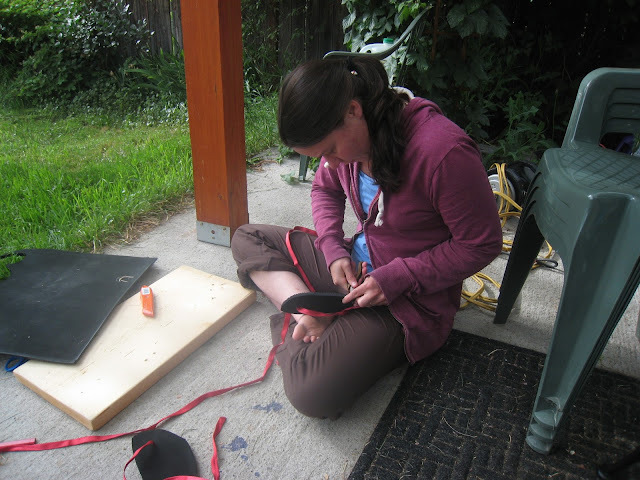 Grab the webbing and pull most of it through, leaving a couple inches of slack between the toe slit and the ankle slit. Release the webbing from the pliers. 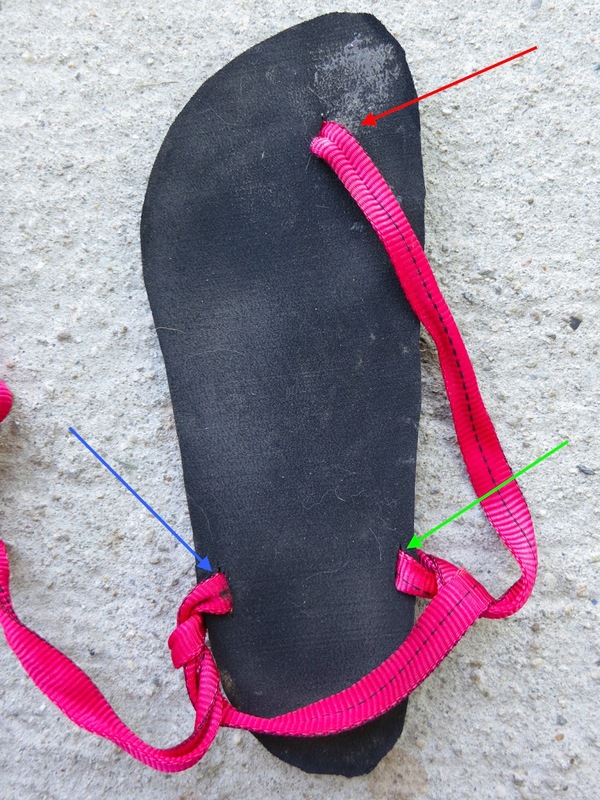 You can slip your foot into the sandal at this point to help with adjusting the strap. 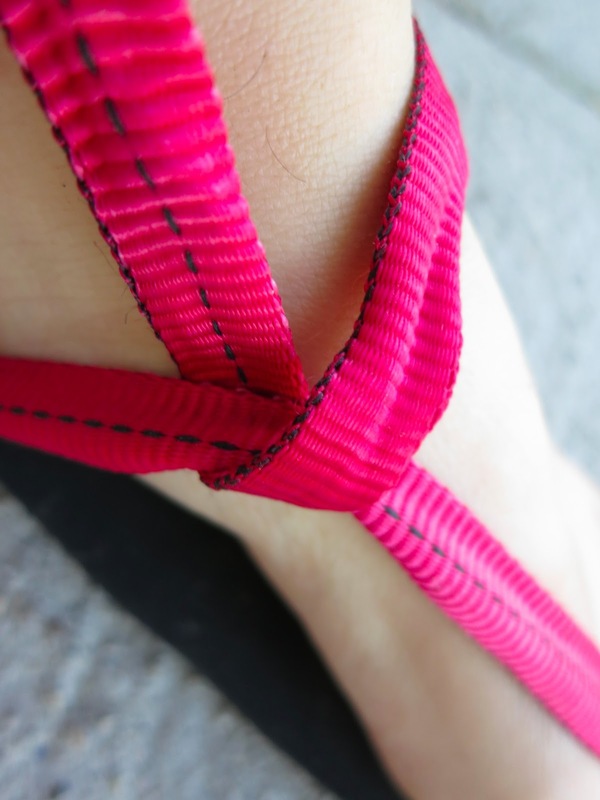 Take the webbing in your fingers and wrap it up and around the webbing near the ankle slit. You may wrap it once or more times depending on how high you want the straps the rest on your foot. I wrapped the webbing twice. This is the finish of one wrap. 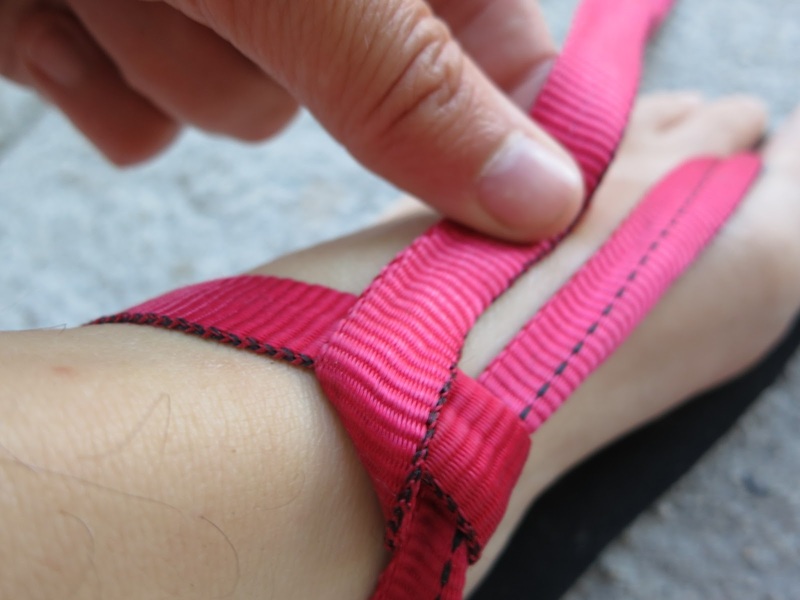 Wrap around a second time if you would like to the webbing strap to end up higher on your foot. Time for the last slit. 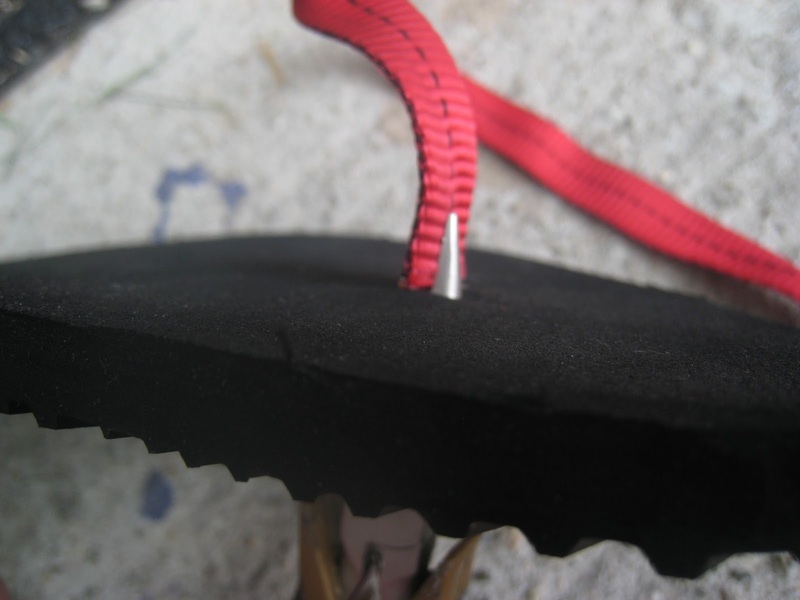 Push the pliers through the footbed from the sole side to the foot side at the ankle slit. Grab the webbing and thread it through, leaving a little bit of slack. Release the pliers from the webbing. 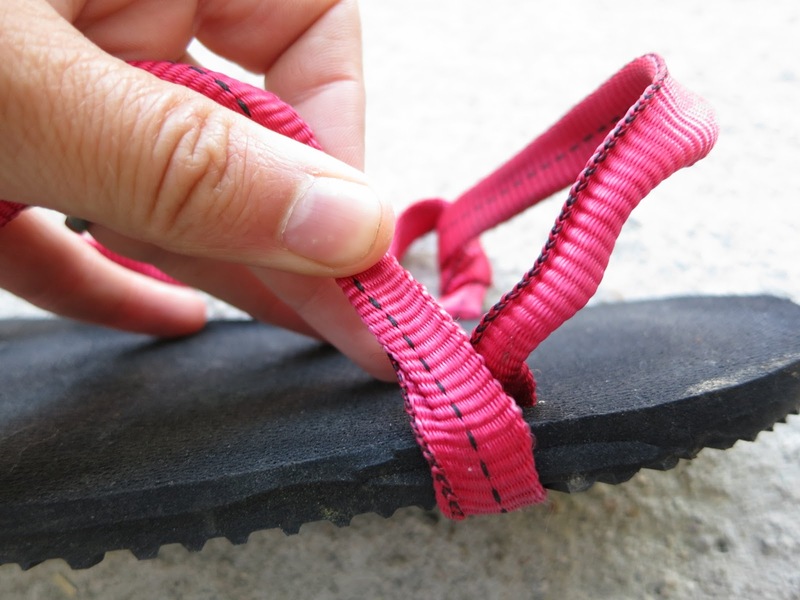 Take the webbing in your fingers and wrap it once or twice around the webbing coming straight out of the slit at the instep. Your sandal is almost complete. 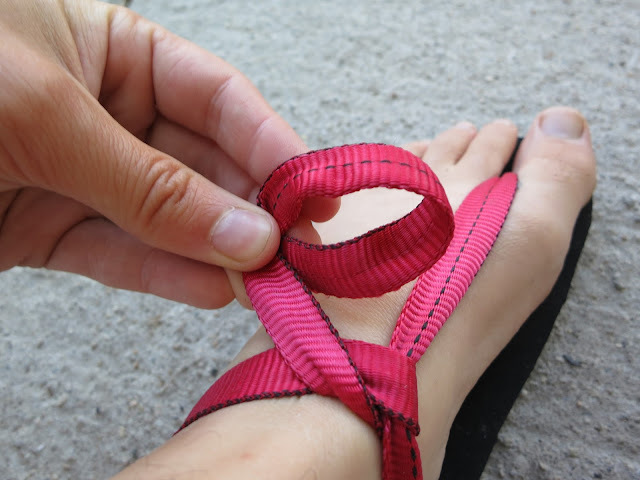 Next you want to fit your sandal before you cut the webbing to size. 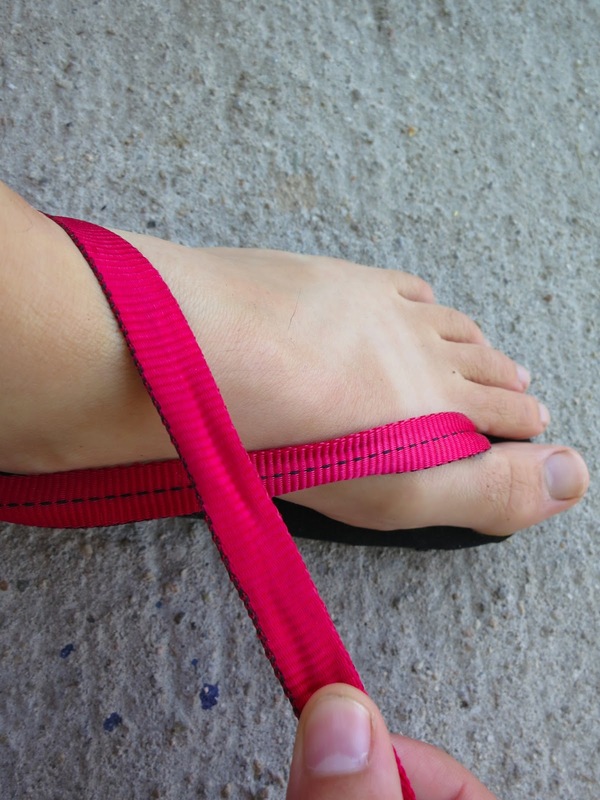 Slide your foot into the sandal and adjust the straps to comfortably and snuggly fit around your foot. Tie the finishing knot before you cut the webbing so you don't cut too short. My women's size 7 foot ended up with 14 inches of webbing for the strap between the instep and the finishing knot. It is a little bit long, but gives me extra to tie a good knot. The finishing knot is a slip knot. 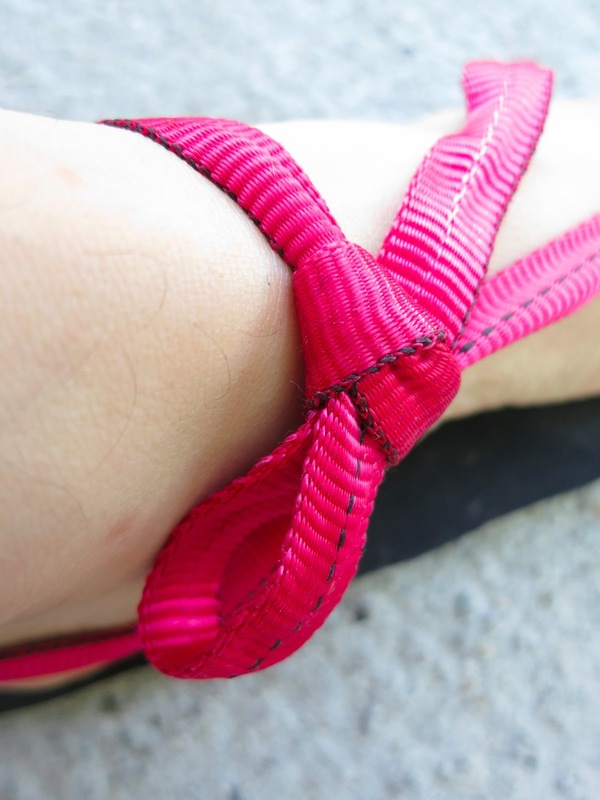 Tie a slip knot around the strap leading from your toe to your ankle. I tried to write directions for this knot but it got complicated quickly, see photos below for visual directions. Cross the webbing over the strap you just made from our ankle to your instep. Loose end points toward your toes. Make a loop in the loose end of the webbing. The one in this photo is a bit large. Push the loop through the space between the straps at your ankle. I find that the sandal is most secure when I tie my knot up high on my foot closer to my ankle rather than close to my toes. Now, very carefully take your lighter and lightly melt both ends of the webbing so that they don't fray. Congratulations! You have a new custom fit sandal. Now, go through the process for your other foot to make a pair. We got the idea for these sandals from Luna Sandals and the Backpacking Light forum, and of course the original huarache sandal/running shoe from the Tarahumara tribe in Mexico's Copper Canyons. With our patio thermometer hitting 90-100 F most days I've been dreaming of shady north facing cliffs by deep swimming holes. 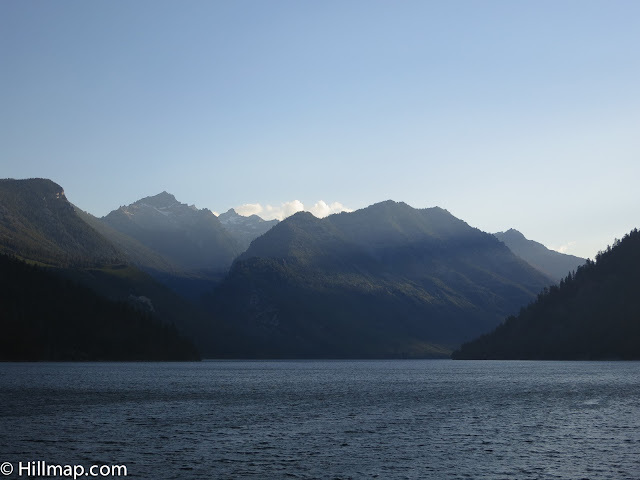 With that in mind grabbed my bike and headed up to check out some north facing cliff bands visible on satellite photos at the west end of Lake Como (the Lake Como in the Bitterroots...the European one). 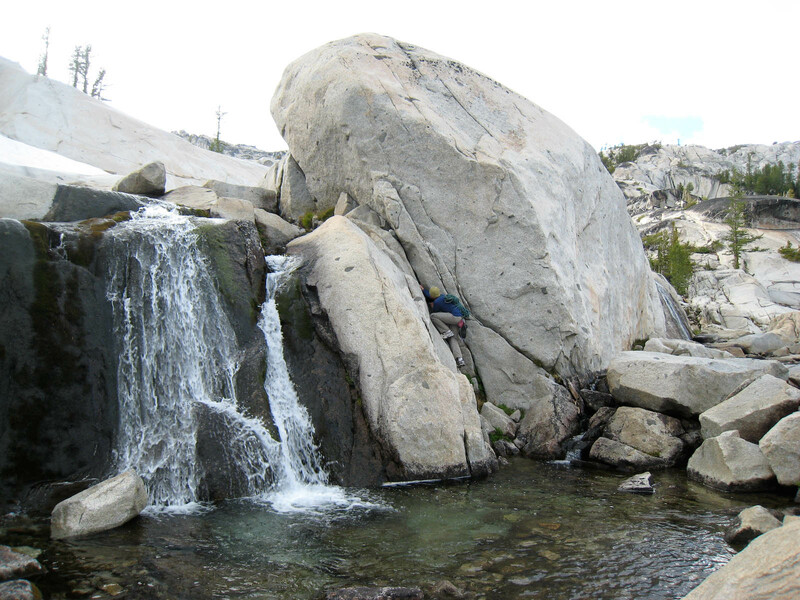 Rock Creek just above where it flows into Lake Como with a long, ~50 foot cliff band to the left. 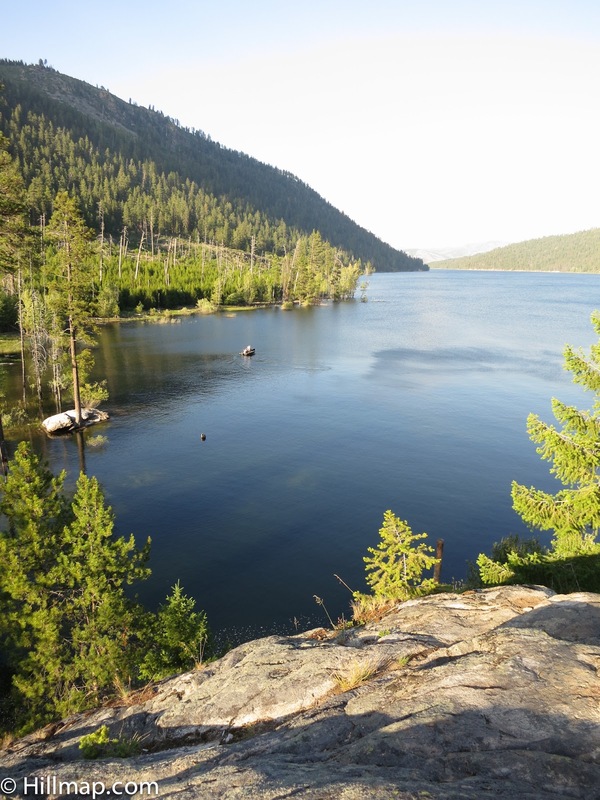 A possible deep water solo at the west end of the lake (lead photo is the top of this). Are those bolts near the center of this photo? The trail was both more technical and more rolling then I expected (especially the SW corner of the lake where the cliffs are). It took longer then I had hopped and is maybe not something to ride after work with a crash pad or heavy trad gear. It is a fun ride in its own right and I'll definitely do it again. 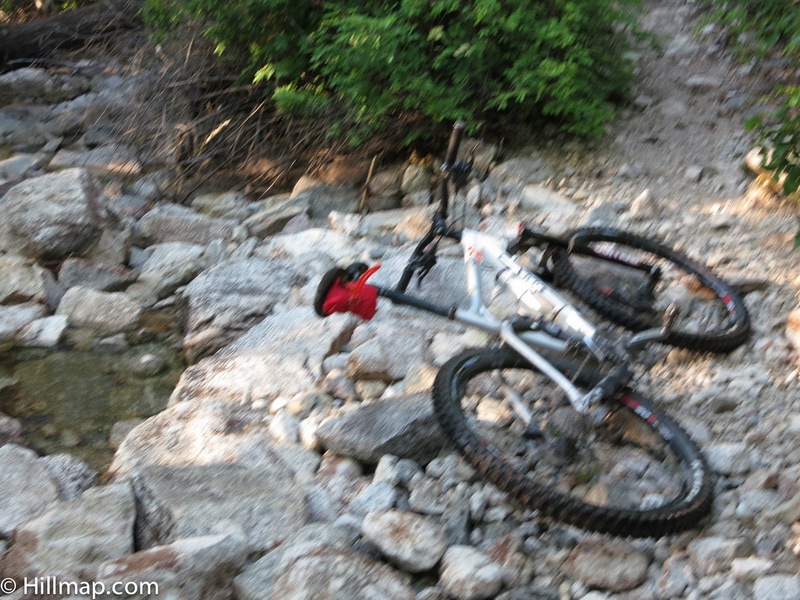 My bike near the crossing of Little Rock Creek. Note the Patagonia Houdini voile strapped under the seat, my concession to a forecast of possible rain and hail. And the blurry photo, testament to fading day light. 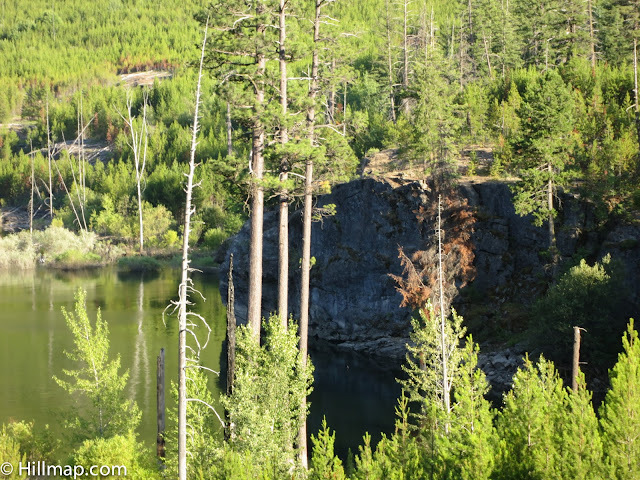 There were some smaller boulders and cliff bands closer to the roads at the east end of the lake that might be worth investigating on foot and the idea of using a boat to approach the West end of the lake is very intriguing. The view back up lake from the dam. Another view from the dam. Cool to be able to see most of the ride stretched out like that as you ride the last bit back to the car. 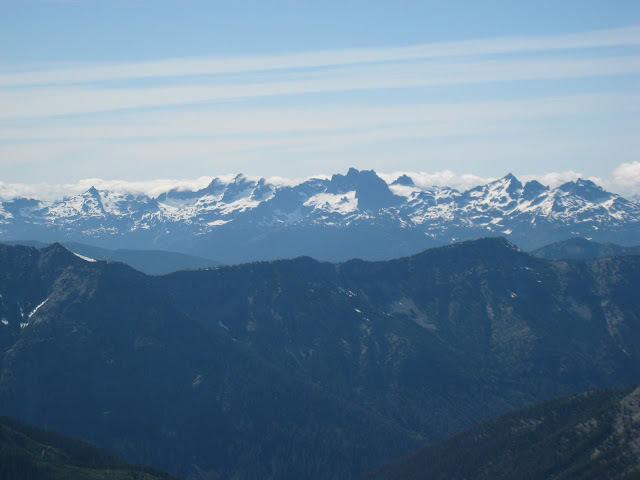 For most of my adult life, Leavenworth, WA was the name for paradise (although I seem to have found a new paradise now). 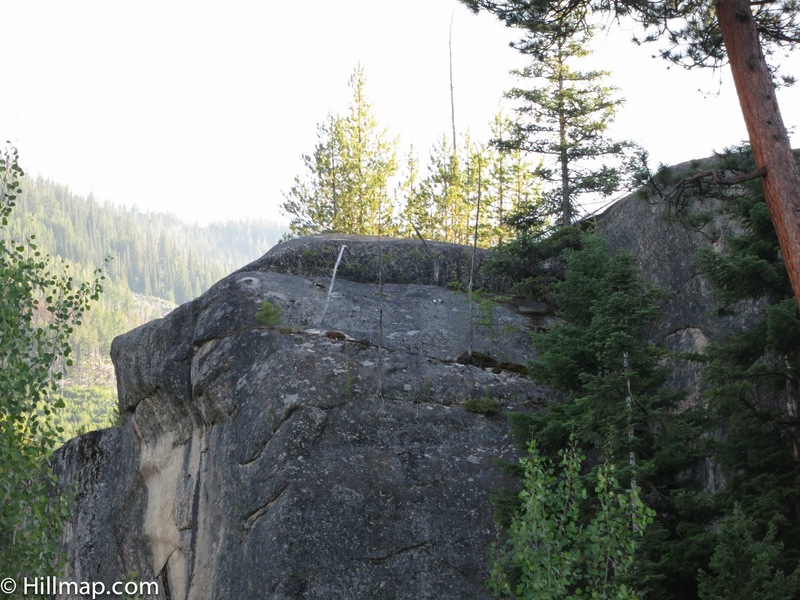 Icicle Canyon stretching south past the turnoff at the 76 holds untold wonders of rock, mountains, rushing creek and mighty ponderosas. If you've been there, you know what I'm talking about. Ryan and I spent the weekend in Leavenworth to celebrate the wedding of a good friend, renew ties with other wonderful friends and meet new people. 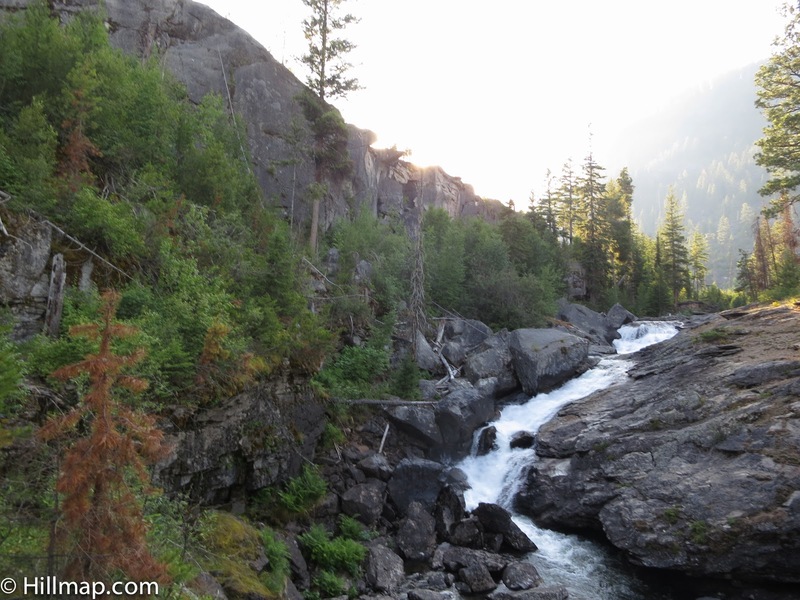 We did not stay for long, but made sure to spend a couple hours among the shady boulders, jump in Icicle Creek and eat lunch in a beautiful place. We left our camera in its case, but I'll share with you photos from previous trips of many fun days spent in the canyon. Meeting the physical and mental challenges I found for myself over the years in such magnificent surroundings was rewarding and profoundly shaped my view of how life works. As Ryan says, working hard in nature is one of the keys to happiness and living a rich life. Wherever your Leavenworth is, I hope that you make the time to spend happy days there soon.